France, reviewed by King George V of England, discover the Meuse River and die as far away as Murmansk, Russia. The Navy patrolled the East Coast for German submarines, called U-boats, and protected the waters around Gibraltar and Corfu. Atlantic convoy duty shepherded merchant and transport ships across enemy-infested waters. The Navy sank a German submarine, U-58, off what is now Cobb, Ireland. Floating explosive mines were placed in the North Sea. In 1917, the world map got a lot bigger for Americans. But those who served overseas took their family and cultural traditions with them, including their celebration of Christmas. The first mention of the holiday by an American “over there” came from Frederic Coleman, a volunteer serving with the 2nd Cavalry Brigade Headquarters, British Expeditionary Force. Folks at home could send packages to troops overseas as long as they were 3 pounds or less and no larger than 9 inches by 4 inches by 3 inches. Packages were sent free of charge from Hoboken, N.J. Perishable items were discouraged; the most requested items were cigarettes, tobacco, warm clothing items, soap and anti-flea (cooties) powder. Santa Claus even made appearances among American troops, delivering treats of the season. One YMCA volunteer, Don R. Guthrie, arrived in a full red outfit, complete with a wispy cotton beard and a papier-mâché mask, ironically made in Germany in 1912. His outfit is in the collection of the National World War I Museum and Memorial in Kansas City, Mo. 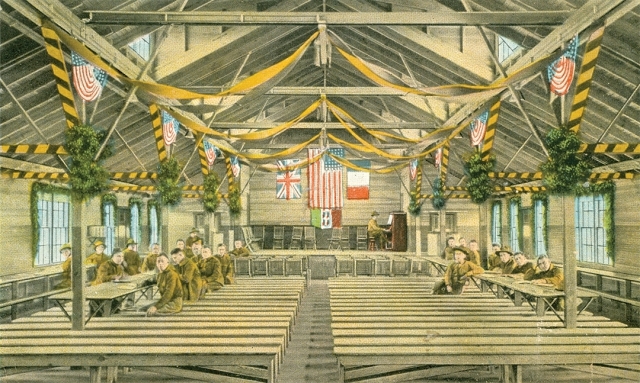 The 1918 Christmas dinner menu for Base Hospital 202, American Expeditionary Forces in Orléans, France, included “roast young turkey, sage dressing, mashed potatoes, creamed carrots, lettuce salad, fruit cake, chocolates, English walnuts and coffee.” This was a far cry from the doughboy’s normal fare of hard tack and coffee or slum (a stew of beef, potatoes, onions and carrots) and dessert of a spoonful of Karo syrup. During the Allied occupation of Germany following the armistice, American troops in Coblenz raised a Christmas tree in front of the government building. Covered in long strands of lights, it brightened the area after dusk. As live music entertained the large crowd of soldiers and German civilians, local children received paper trumpets and other goodies pulled from soldiers’ pockets. For the first time in years, the windows were lit, and a lighted cross was placed on top of the building. For American servicemen and women in World War I, far from home and hearth, Christmas still managed to bring some joy and peace. Doran Cart is senior curator at the National World War I Museum and Memorial in Kansas City, Mo.